Congratulations to Timitra, the winner in Dana's giveaway. Thank you to all who participated! When my great grandmother was young, she was home alone one day with two young children. They went into the house at the end of the day, and as she sat on the bed to take her shoes off, she saw, in the mirror across the room, that there was a stranger hiding under her bed. She kept calm and said to the kids, “You know how silly I am? I forgot to lock up the chickens for the night. Why don’t you put your coats back on and we’ll run out for another minute and take care of those hens?” And then she got herself and the kids out of the house. She ran to the neighbors who came home with her and got the vagrant out of her home. My grandmother still tells this story all the time. It left a big impression on her as a kid. And every time I think of it, I hope I’d have the same presence of mind if I were ever in a spot like that. Talking about women being strong is very trendy these days. But I think, whether it was acknowledged in the past or not, women have always been strong. I write strong heroines. That’s the only kind of women I know, from my brave-hearted great grandmother, to my grandmother who’d survived Russian bombs and the house collapsing on top of her in WWII in Europe, to my mom who went to work at a restaurant as a high school dropout, worked her way up to being head chef, and worked 16 hour shifts all her life. When I stared writing Deathscape a couple of years ago, the heroine’s story was a little different than what you see in the book now. My artist heroine is in a tough spot. A child in her care lost his life. She nearly lost her own life in the accident, was clinically dead, her rescue hailed as a medical miracle. She’s never been the same since, tortured by panic attacks and dark visions. Her father is raising her daughter, because she’s not fit for the role at the moment. Her career is collapsing, because instead of her usual popular landscapes, she’s compelled to paint dark visions of the dead. Then she paints a man who’s been buried alive in a shallow grave. When she recognizes the surroundings, she rushes to save him. But, instead of being grateful to her for rescuing him, Detective Jack Sullivan accuses her of being the accomplice of a serial killer. I kept writing scenes where the hero was rescuing Ashley, but none of it felt right. In fact, I kept putting this book away, over and over, and moving on to other projects. I must have worked on this book for 4 or 5 years. Her story needed to be told, so I couldn’t let it go, but I couldn’t figure out what was wrong with the way I was writing it. Then one day I finally saw the light. Ashley might be in a tough spot, but she’s a strong woman. I had to let her solve her problems herself, instead of trying to do it for her. She was a mother who would do anything for her daughter. Just like my great grandmother would have done anything to keep her babies safe. As soon as I understood that, the book fell into place. It was finally published this month, and so far the reviews are absolutely amazing. Who were the strong women in your life? I would so love to hear some stories. I hope you’ll share here. As always, I’ll raffle off a free book among those who share. This time, it’s a copy of THE THREE COWBOYS, a romantic suspense anthology I did with Julie Miller and Paula Graves. I recently got my author copies. The book won’t be in stores until mid. Dec. I think, but you have a chance to win it here! Wow, I can't believe your grandmother was so calm. 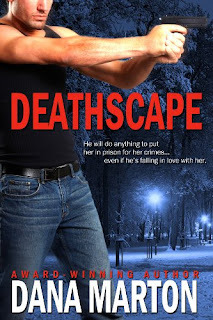 Deathscape sounds like a great book (and a little scary) with a strong heroine. I love those strong women. In my life my mother-in-law was probably one of the strongest women I knew. She battled cancer for about 16 years until she lost her fight a few weeks ago. She never let the cancer or treatments stop her from living her life. I am sure she was frightened many different times but she would take a day or so and deal with it but then put it behind her and live her life with her family. She is my inspiration of a strong woman. Thanks for the opportunity to win a book. Amy, your mother-in-law sounds like an amazing woman. Thank you for sharing her story! I believe woman through time have been strong. It wasn’t a wimpy woman who crossed the ocean to come to a new uncharted world. It wasn’t a wimpy woman who stood beside her man to clear land and push a plow, or go across a continent to settle. Those who fought to get women the vote were put in jail and beaten for their efforts. Think about the women in London during the second World War. They sent their children away to the countryside to be safe from the blitz. They could have gone also but stayed and took jobs to allow the men to go to war. The women in the US and Canada who took over men’s factory jobs for the same reason. The women in the 60s who stood their ground and demanded equal pay for equal work. I could go on and on. Bottom line is, we know so little of the women who went before us and they have given us so much. They are all my heroines. My grandmother was my rock. Such a tiny little woman that had a strong will and a huge heart. She had two kids to care for when my grandfather went off to war... later on when they moved to a different state for my grandfather's work, their families treated them like black sheep... they lost that closeness they had with their big families... even when they moved back things were never the same... She had a lot to deal with in life ...for me she was the most wonderful and beautiful person that ever was in my life... showed me that I was loved. My mother is one of the strong women in my life. She did her bachelors and masters while working and raising four children. Thank you, Debra! I love this site, too. I always find something good to read here. Rita, I LOVE your comment. Wish I knew a way to share it on FB. You are soooo right. Colleen, your grandmother sounds like an amazing woman. Thank you so much for sharing her story! I can totally relate. I love my grandmother. Since my mom worked 16 hr shifts, my grandmother spent a lot of time watching over me. Those are my best childhood memories. Thank you for posting, Timitra! Wow, your mom is a great role model. We are all very lucky to have women like that in our lives. One strong woman can inspire generations of others. My dad was on the fire dept. Once in my early teen years my mom and I walked to a fire. When she realized where it was she said she had to go home, because there were chemicals there and she was worried about an explosion. It was the first time I realized the fears my mom had to face every time my dad went to work. Wow Dana...your Grandmother's presence of mind was amazing, as was her follow-through. I would be interested in seeing how you portray your characters. I would have to say my Grandmother was the strongest woman. After her husband killed himself, leaving her with four children from 2 -12. She worked a librarian to support her family. raised her children with good ethics and values. She was a loving and wonderful lady. Joyce, What a story! I'm sure being a firefighter's wife was hard on your mom. My grandmother is a strong woman. She is 93 years old and often tells me stories about when she was a young woman in England and how she made ends meet. She worked long shifts on the buses and had some very interesting and scary encounters. She landed a job in a hospital as a cook when she had no experience cooking for large groups of people and winged it. She was fearless and a hard worker. Traits that I admire. It makes you wonder what you would do in such a situation. I love how you are 'encouraging' you heroine to work out her own problems. My Mother is a strong woman. She's intelligent & not one to back away from a problem. Sandra-- What a story! Has she ever thought about writing a book about her life. I'd buy it! Mary-- Sounds like you have a great mom. We are all lucky to have these strong women in our lives.